Mini Cymbidiums Orchids are a smaller version the classic Cymbidium. 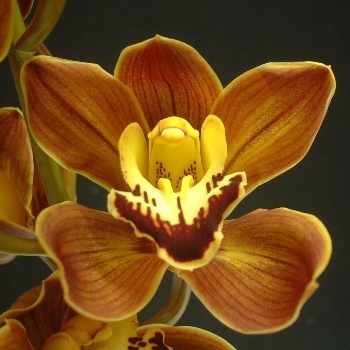 Amber Brown is a perfect blend of yellow, orange and burgundy mini cymbidium orchid. Striking by color, friends will be amazed at what unique beauty this orchid holds. Perfect for a wedding flower arrangement, corsage or a loving gift. Mini Cymbidium Orchids have 8 to 11 blooms per stem. Buy amber brown orchids at wholesale prices, direct from our farm to your doorstep. SHIPPING included in price. With this package, you will receive an amber brown flower that is a blend of yellow, orange and burgundy, with no specific lip color. The amount and intensity of each tone may vary depending upon Mother Nature. Cymbidium Orchids have an average of 8 to 11 blooms per stem. Length from bottom of stem to the first flower will range from 3 to 5 inches. Average stme width is 1/16th of an inch in the largest circumference including blooms 2 to 4 inches. Orchid flower meaning is love, beauty, refinement, beautiful lady, Chinese symbol for many children, thoughtful, maturity, or charm. Cymbidium Orchids are one of the most popular and attractive orchids in the world because of the beautiful flowers. Cymbidium Orchid flowers date back to the dinosaur age.